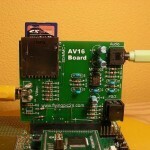 The AV16/32 Board is a PICTail(tm) Plus board designed to expand Microchip Technology’s Explorer 16 Development Board and compatible with the PIC32 I/O Expansion Board. It provides the combined functionality of several standard PICTail Plus boards (SD, Audio) and additional interface options for a fraction of the cost. After assembling this board you will be able to test all the code and follow all the experiments illustrated in the “Flying the PIC24” and “Exploring the PIC32” books. The stereo output circuit uses active 2nd order filter circuits to produce quality audio from the PIC24 PWM outputs. 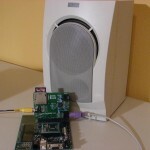 The signal can be connected to high impedance headphones, PC speakers, or a PC sound card input. The SD card socket connects to the SPI2 channels on the PIC24/PIC32. 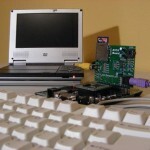 The PS/2 keyboard input can be connected to the Change Notification (CN) input pin, the Input Capture (IC) input pin or a generic digital I/O. The video output uses an Output Compare channel and a SPI channel to produce monochrome NTSC (or PAL) composite video. All components are through hole for easy assembly. Only a basic fine tip soldering iron is required. (First class mail – shipping included).